On a budget? We hear you! You don’t have to settle for a cheap, lackluster piece of equipment when brands like Behringer deliver condenser mics with great performance on a budget. The B-1 proves to be a real winner, especially when you consider it comes in at under $100. It’s time to take a closer look! In a segment of the market where you are usually required to accept uninspired, bland microphone designs, the Behringer B-1 comes across as a breath of fresh air. The body of this a chunky little device features a vintage satin nickel-plated brass finish, which is simple but very attractive, while the grille is a two-piece design, revealing it has a side-address layout. As a whole, it’s a very durable piece of equipment that is undoubtedly one of the most attractive models you can buy in this price range. One of the things that defines the B-1 in this price range is its large diaphragm. Here we are looking at a 1″ diaphragm with a gold-sputtered design. In terms of specs, the B-1 features a frequency response range spanning from 20Hz to 20kHz, as well as a pretty hefty SPL of 148dB. It has a fixed cardioid polar pattern. In terms of features, the B-1 is loaded with a handy -10dB switch that helps with attenuation, as well as a low-frequency roll-off switch. These features are quite rare in this budget price range, but are always welcome additions. Meanwhile, at the bottom of the mic, you will find a gold-plated balanced XLR connection to hook it up to an audio interface, meaning the B-1 will require phantom power to operate. Finally, for this price, we weren’t expecting many extras, but Behringer have surprised us with the inclusion of a heavy-duty suspension mount, a handy windscreen, and a sturdy padded aluminum transport case – a very good haul for under one hundred bucks. The specs look quite impressive on paper, but how does this all translate when in use? Pretty well, as you may have guessed. The actual response is fairly flat throughout the range, which makes it a good choice for both vocals and instrument recording, with both coming across as fairly organic. But it’s not limited to quieter instruments – thanks to its high SPL and the addition of the 10dB pad, this mic can take high volume input from instruments like drums without distorting. Overall, the performance means this mic is certainly punching above its weight. 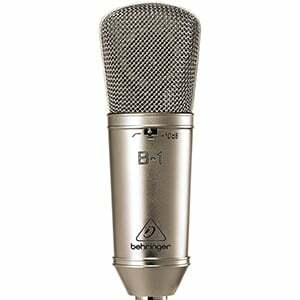 The Behringer B-1 may not be the best condenser mic in the world, but it comes out as one of the top performers in the affordable price range. The performance it offers, how it handles high volume input, and the overall quality makes it a smart choice for any home studio. For more info about the Behringer B-1, click here.